Our handsome boy, Coco Puffs, is a debonair fellow who would charm any adopter. He recently joined us from NYCACC after his owners abandoned him to an uncertain fate. Coco Puffs seemed to fare pretty well in the shelter setting, although he did display some understandable fearful behavior as he adjusted to the shelter process. 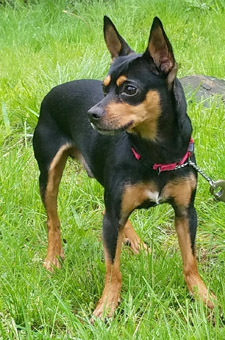 Although Coco Puffs received good behavior evaluations, he seemed to show signs of stress as he adjusted to shelter life. He was overwhelmed and overshadowed in the shelter adoption program. In a short time, he caught the shelter kennel cough and was relegated to the euthanasia list. We are happy that our shelter contacts rerouted him to our rescue. 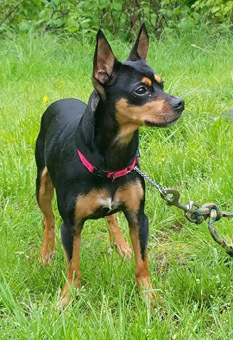 Coco Puffs is a robust Miniature Pinscher with a stance and carriage that screams "King of the Toys". 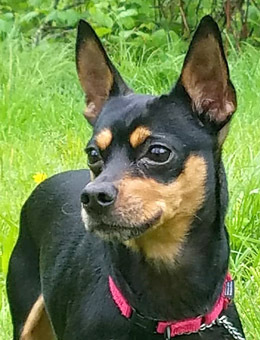 He is a big boy, for a Min Pin, weighing 12 pounds. His short flat coat is breed standard black and tan, with a smidge of gray on his muzzle, that reveals a five to six year old age range. As an adult dog, Coco Puffs is well past the puppy mayhem stage. We think that Coco Puffs would most enjoy a quiet lifestyle with an adult single or couple, who love lap dog companionship. 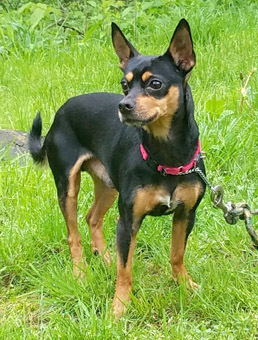 Coco Puffs tends to steer clear of chaos and would not be a good fit for a busy family bursting with kids. He is a moderate to low energy dog, and likes to relax by the fire or nap in his person's lap during TV or Book time. 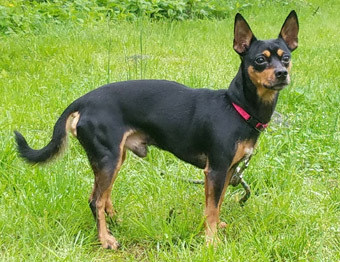 He's relatively quiet for a Min Pin, and would be the perfect apartment dog. Coco Puffs could easily join a multi-dog home with one or two other laid back dogs or cats, but would be overwhelmed by large, high energy dogs. He has a calm vibe, and could be a comforting companion to a senior dog, who recently lost a beloved house mate. 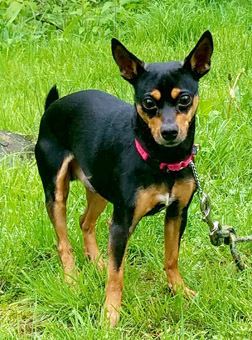 Coco Puffs has good house manners, is house trained and crate trained, and can easily be persuaded to use a wee wee pad in the inclement weather. Adopters should expect to troubleshoot the occasional accident that will inevitably occur during his transition to a new home. Coco Puffs is in excellent health, and is at a lean body weight. He is recently neutered, and has had a dental cleaning. His preoperative bloodwork was normal, and provides the adopter with baseline values going forward. He has been vaccinated for Rabies, DHLPPC (distemper, hepatitis, leptospirosis, parvo, parainfluenza and coronavirus), He has been boostered as needed. He has had the 4dx test: negative for heartworm, lyme, earlichia and anaplasmosis. He has been dewormed, and microchipped. He has been on appropriate heartworm and flea/tick preventatives. If you are interested in Coco Puffs, please write to Denise@eskiesonline.com or call Denise at 860-908-9738 for more info.